Brigadier Ian Geddes was given the responsibility to establish an ‘Officer Training Unit’ to increase the numbers of junior officers available to meet the needs of the National Service scheme. 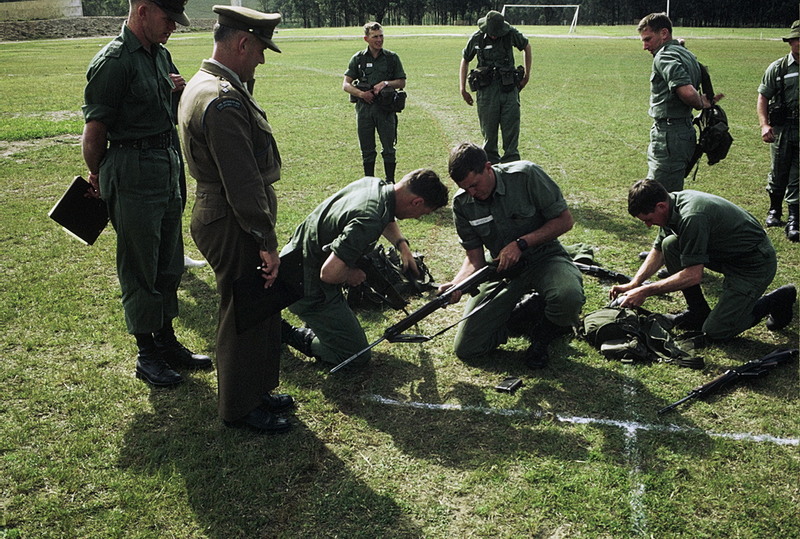 On 1 April 1965, Scheyville became the home for the Officer Training Unit. The Camp had been used as a hostel for the ‘Dreadnought Agricultural Training Scheme’ at the end of the last century and after the First World War it became an internment camp for German ‘aliens’. During the Second World War it was used as an Army training centre. In 1949 the Camp became the first temporary home for many migrants who wanted to start a new life in Australia. Brigadier Geddes and his staff designed a course where single lessons often incorporated several aspects of the syllabus to accelerate the learning process. The OTU cadets’ days comprised ten to 14 hours of demanding physical training and intensive mental precision – for 22 weeks. Although the course was primarily designed to produce Infantry Platoon Commanders Second Lieutenants, the graduates were posted to all Army Corps and served in units around Australia. Many served in South Viet Nam, Papua New Guinea, Malaysia and Singapore. Eight were killed in action in Viet Nam. There were 1,883 Graduates from OTU Scheyville. These Graduates were made up of 1,690 National Servicemen, 111 Short Service Commission Air Cadets, 68 from the OTU Wing of the Officer Cadet School, Portsea, 3 from the RAAF and 11 from the Citizen Military Force. The OCS Wing was established in 1972 to increase the number of officers ranks in the Army at that time. To promote youth leadership and development training in order to provide a life enhancing opportunity to young Australians. Many who attended Scheyville and went on to become successful businessmen and leaders in their fields cite the training that they received at Scheyville as having contributed to their success. Those who did not graduate, but still shared ‘the experience’, are nevertheless welcome members of the Association. Former Directing Staff are also welcome, (all is forgiven) as without them ….